Children begin to empty classrooms as the final bell has rung. The hallways once filled with hurried feet have become vacant. Summer vacation is here. We once had the responsibility to help our children learn and grow, but that has been put on hold. Because of the newly found free-time, many parents struggle to find ways to keep their children busy. Distractions begin to present themselves over the next couple of months. Entertainment is provided by television screens, video games, and tablets. Social lives begin to take precedent over learning opportunities. As a result, the knowledge gained throughout the year begins to slip through the fingertips of our students. According to research on the topic done by Oxford Learning, the equivalent of one month of overall learning is lost during the summer. 2.6 months of math skills are lost. Despite the effort to teach our children reading skills, nearly two months of these skills are forgotten. The curriculum used during the first six weeks of fall is spent reviewing old material to make up for learning loss. By the end of their sixth grade year, any student experiencing learning loss become an average of two years behind their peers. 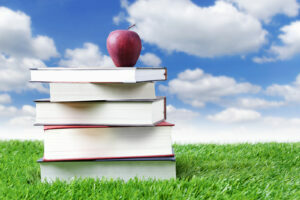 In order to prevent this summer learning loss, two to three hours per week of learning opportunities is recommended. Whether we are indoors or outdoors, learning activities are present. Healthy bodies help contribute to the learning process. Outdoor activities help keep the mind and body active and eager to learn. 1. Miracle-Gro Kids: My Very Own Flower Garden Kit If there’s one thing children love, it’s to get their hands in the dirt. Not only does gardening allow that fun, it also presents many learning opportunities. Weekly measurements of the plants provide math lessons. Garden vocabulary such as stem, root, and photosynthesis allow children to gain language knowledge. 2. BIBNice Bug Catchers and Viewer Microscope Bugs are fascinating creatures in the eyes of a child. Distinct features that are different with each insect make observing them fun. Drawings, sketches, notes, and graphs about bug findings make children better observers. 3. 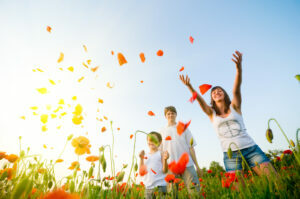 Make Regular Visits to the Local Park Taking a walk in the park with family is fun and healthy. Regular walks strengthen your brain and improve your memory. Daily exercise and brain grown is important for children. Jumping rope is a great way for a child to learn about depth perception. 4. Target Practice Throwing various items is a skill every child is born with. Because of this, setting up a target in the backyard enhances this skill. Visual acuity is enhanced when children have opportunities to perfect their aim. Enroll your children in an archery club or little league team, or practice with your child in your backyard. 5. Sand and Water Table Filling your sand and water table this summer will keep your children busy and provide many learning experiences. Throwing ice in the water table teaches the properties of water. Experimenting with different textures in the sand table is important for young children. In addition to outdoor activities being important over the summer, children need indoor learning opportunities. 1. Ice Cream in a Bag Playing outside in the summer can be very hot. Because of this, allowing your child to get messy in the kitchen to create a cool treat can be fun and rewarding. Measuring ingredients and pouring them into a food storage bag is a fun activity for every child. 2. Create a Calendar By engaging in a small calendar discussion daily, children are able to learn about current events and gain a better understanding of their days of the week and months of the year. Print out our blank calendar for your child to learn with this summer. 3. Write a Short Story Children were born to be story tellers. Because of this, an opportunity to put pen to paper and write down a story is a great way to get children excited about reading. While your child is telling you the story, help them to write the words and draw the pictures. Reading stories they wrote is an exciting experience and helps them to develop higher language skills. 4. Build a Castle Another activity almost every child enjoys is building and knocking down towers. Problem-solving, self-expression, and science are skills that children acquire during block play. Attempting to build the castle a certain way and correcting mistakes develops a child’s thinking process. 5. Paint with Different Objects in Your Home Painting with different materials around the house teach children about different properties of these materials. Placing a sheet of card stock on a cookie sheet and allowing children to paint with magnets is a fun science experiment. Cutting up sponges or pieces of yarn provides exploration opportunities in how different shapes make different patterns on the paper. While many of our followers use Have Fun Teaching for resources throughout the school year, some are unaware of our summer resources. Here are some resources your children can use inside or outside the home! 1. Summer Graphing Activity While spinning the pinwheel 20 times, children put a tally next to the picture the spinner lands on before answering questions and graphing their results. 2. Four Seasons Activity Using the picture cards, children will identify and sort characteristics of each of the four seasons with the provided sorting mats. After sorting, play Seasons Spin! Deal the picture cards to a small group of players. Players take turns spinning the spinner, and discarding a card that is related to the season the spinner has stopped on. The player to get rid of all of his/her cards first is the winner! 3. Telling Time Clock Activity – To the Half Hour Telling time is fun when matching clock pictures to time cards! 4. Telling Time Clock Activity – To the Hour Learning about time enhances as another time activity is available. 5. 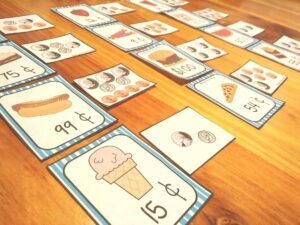 Sweet Summer Treats Money Addition Activity Matching money cards to pictures of food with prices on them allows children to gain a monetary knowledge. By answering questions on the provided worksheets, children can learn to organize data and add money. 6. Summer Time Back to School Writing Activity Choosing from ten writing prompt cards, children answer a question about their summer and draw a picture to go with their writing. This activity is perfect for the end of summer. 7. 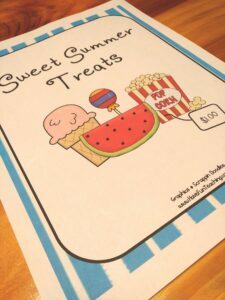 Reading Comprehension Worksheets Enhancing reading comprehension skills throughout the summer will prepare your child for reading lessons in the upcoming school year. Developing new skills and knowledge are two things all of us should work on every day of the year. Because we want your children prepared for the upcoming school year, engaging in these activities daily helps them to retain previous knowledge throughout the summer. Don’t forget to “Heart” your favorite summer resources, and remember to Have Fun Teaching!